In this article, I am going to share a nice jQuery plug-in for running news ticker vertically in your web pages. 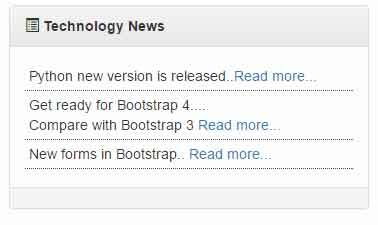 The plug-in is implemented on Bootstrap 3 framework. The news ticker is auto play as well as supports up/down manual movement. You may scroll any content in up and down direction including text, images etc. You can see, three items are displayed as the demo page loaded. The news ticker will pause as you bring the mouse over any news item. In real time website, you may want to use the bigger interval than 1500 milliseconds. I have used it for demo purpose for showing how it works. As mentioned earlier, you may set the auto play option false, so letting the visitors navigating the news manually by using the up/down icons. The markup remains the same for this demo as in above example. You may download the complete package of the plug-in from the Github website (Credit: gagi270683). You may also get the required JS and CSS files from the demo page (view source). 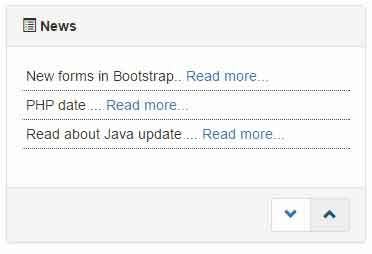 Include the references of Bootstrap CSS, plug-in CSS, jQuery and plug-in JS files in the head section of web page. Use the markup and options in jQuery code as used in the demos.